Pendrell Sound is one of those places I almost don’t want to write about – I’m afraid raving about how much we love it will make more people go and it will become crowded. But I know realistically this is nothing to worry about – because everybody already knows about it, and there’s plenty of room here. And honestly we wouldn’t mind having more sailboats (we could do without the party motorboats and jet skis though – which are fortunately few). Two years ago we came to Pendrell Sound and declared it our favorite anchorage. This year we already declared Pruth Bay our favorite anchorage, but we’re going to have to say Pendrell is also our favorite. Cruisers are allowed to have multiple #1 favorite places… right? 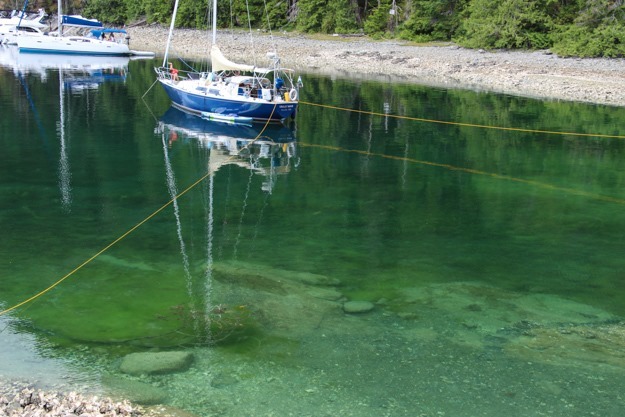 Pendrell Sound is a 6 mile long sound (that looks more like an inlet) in Desolation Sound, known for having the warmest water in the Pacific Northwest (75F currently). 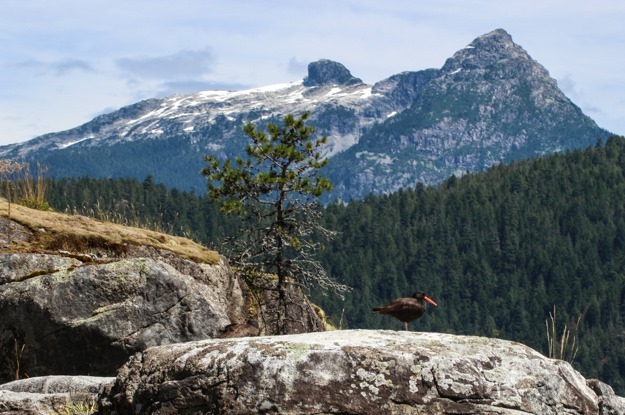 It’s a special place for us because every time we come it has a perfect combination of conditions – hot, sunny, warm water, and beautiful views of mountains (some with snow still on them in late July!). We swim in the 75 F degree water, paddleboard around the anchorage and lagoon, lounge in our inflatable river tube, do boat yoga, catch up on boat projects, and basically take relaxation to 110%. Pendrell Sound is where you go to take a vacation from your vacation. Last time when we were here we stayed for 3 days, and spoke to someone who said he comes for a week every summer. We thought that was genius, and this time stayed for 5 days. We’ve heard some people stay until their holding tanks fill up (Pendrell Sound has lots of oyster farms, so you really don’t want to flush sewage into it). Many boats we saw though stay for only one night. Pendrell Sound also has no cellular reception, which means no Internet. Although Internet is useful for catching up with friends, entertainment and chores (paying bills, etc), it’s also nice to not have it once in a while. It means no FOMO (fear of missing out), no Facebook, no Instagram, no news, no marketing or advertising, and just fewer opportunities for stress or worry. 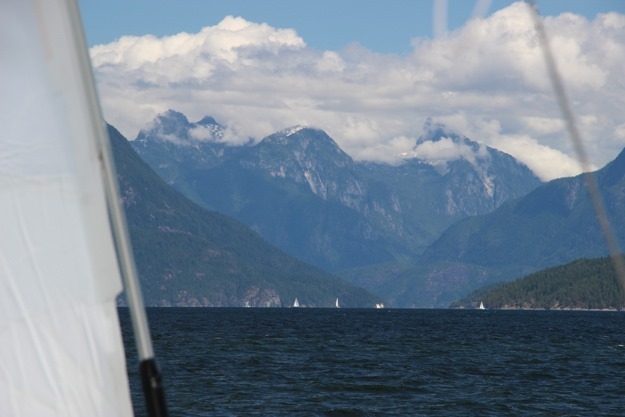 Sailing into Desolation Sound – always amazing seeing these mountains emerge across your bow while under sail. 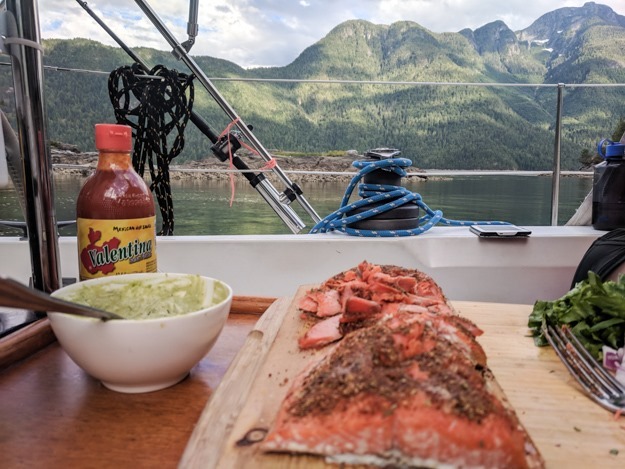 This year we anchored in the nook right outside the lagoon on the western side of Pendrell Sound. Last year we were about 1/4 mile south of here. Many boats anchor in the head of Pendrell Sound (all the way at the end) but we prefer to anchor in the west nook, behind the island, which has enough room for at least 10 boats stern tied. This year though we backed into the north end of this area. The nook we got into is tricky, but we think it’s just about the perfect spot. We had views of the mountains from our cockpit (rather than having our stern tie facing away from the sound), were protected from boat swell from passing motorboats, and had good solar later in the day than the boats stern tied to the treeline where the mountain blocks their sun earlier. Good solar is an important consideration when you’re staying somewhere for 4 days and want to keep your beverages cold. Dual stern tied into a fairly tricky spot – there’s an oyster covered reef to our port, and it gets shallow to starboard and aft as well. Slight wind and current comes on the beam, from both port and starboard at different times of day, so two stern ties helped us stay centered. 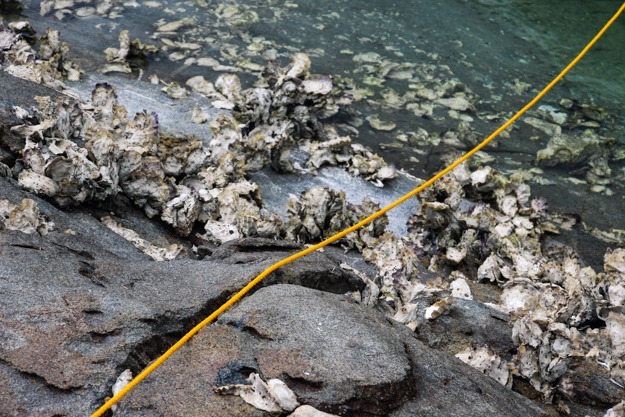 A challenge with stern tying over oyster beds is you have to keep an eye on the line at low tide because it easily gets snagged and could potentially chafe. Those oysters are very sharp. Backtracking a bit, before Pendrell Sound we had a great sail from Campbell River to Prideaux Haven in Desolation Sound. 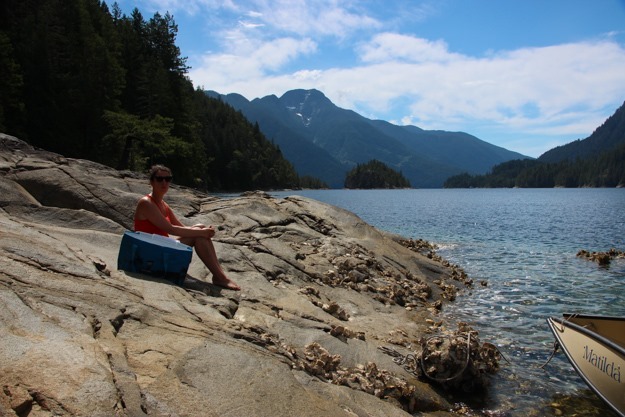 People say you can’t sail in Desolation Sound, but we’ve found that to generally not be the case. 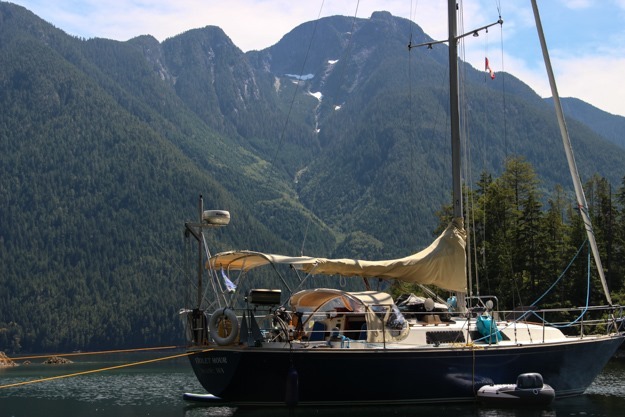 We sailed all the way to Prideaux Haven from Campbell River, using the motor only for two 15-minute stretches to connect between wind holes behind islands. It’s probably true that August sees more windless days, but this July has seemed pretty good so far on receiving wind. 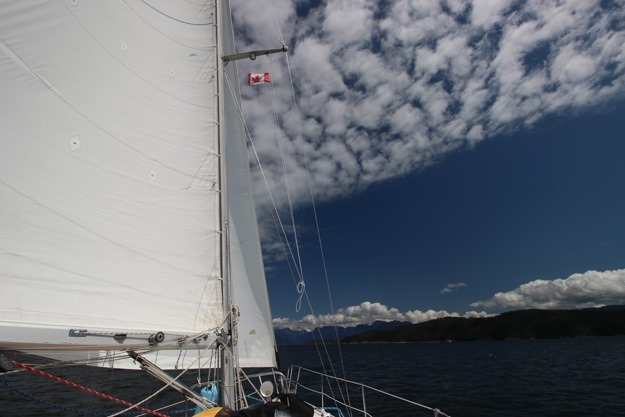 The wind in the afternoon often makes its way into the entrance to Desolation Sound and carries all the way to Prideaux Haven and Roscoe Bay. It usually doesn’t make it all the way up Pendrell Sound, and other northern back channels are likely wind light. 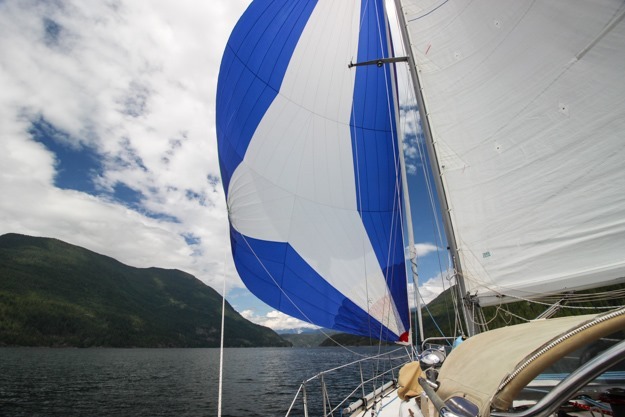 It may be a common perception that Desolation Sound doesn’t have wind because many don’t consider 6-10 knots to be enough to sail in, or they motor to a new anchorage from 10am-1pm, which is before the wind generally starts. Wait till noon and raise a spinnaker and you can have some great sailing. Sailing into Pendrell Sound with spinnaker wing-on-wing in 4-6 kts of wind. A bit cloudy out but those clouds later cleared. Other than our normal daily activities, we had two other focuses during the five days: solar and mosquitoes. For five days at anchor it’s important to charge up your batteries, and 85-90F degree weather stretched the capacity of our solar (the fridge has to run a lot more in that heat). Hourly I’d check our panels for shadows and move the boom so our main halyard wouldn’t cast a shadow on the panels – even that tiny bit makes a difference. We scraped by, but were undercharging our batteries a bit, and would like to get another 50-100W of solar for next year. As evening approached we’d set up our mosquito defenses – which have been working pretty well now that we’ve learned how to deal with them. We have a Thermacell butane-operated mosquito repeller which seems to work well, and a Citronella candle (which works, but doesn’t seem to scare the mosquitoes as much, or has lesser range). We also have screens on all the hatches now except the companionway, which we’re regularly passing in and out of. We set the Citronella up to guard the cockpit / companionway. We still get a few mosquito bites, but at least we don’t have a dozen buzzing around our heads inside the boat at night while we’re trying to sleep. 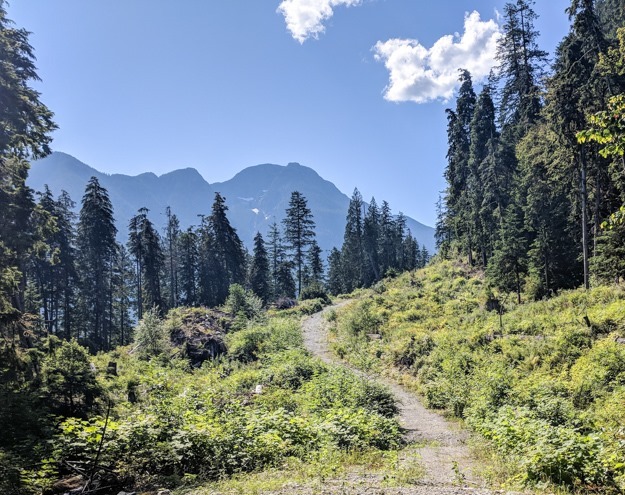 On our second to last day in Pendrell Sound we discovered there’s actually a hiking trail of sorts here – an old logging road accessible from the lagoon next to our anchorage. This was pretty exciting because we love having a way to get off the boat to exercise our legs. The logging road is marked by a large rock cairn a short ways into the south side of the lagoon. The road is fairly overgrown, but no bushwacking is needed, and the vegetation was a lot more diverse than we expected. Many wildflowers were blooming along the trail, and we had views of the surrounding mountains. There were also flies persistently circling our heads and pestering us, following us for a full mile or more, so I’d recommend a good hat and maybe bug spray. After 5 days of rejuvenation and catching up on boat projects we’re ready to get back to sailing. With such relaxing days, it’s a bit hard to think of sailing 20 or 30 miles – sounds like a lot of work. We also know sailing 20 – 30 miles will take 8-10 hours, in very hot weather, because there’s not much wind left now that we’re approaching August. But we’re keeping our fingers crossed for some wind – otherwise the iron genny is firing up. 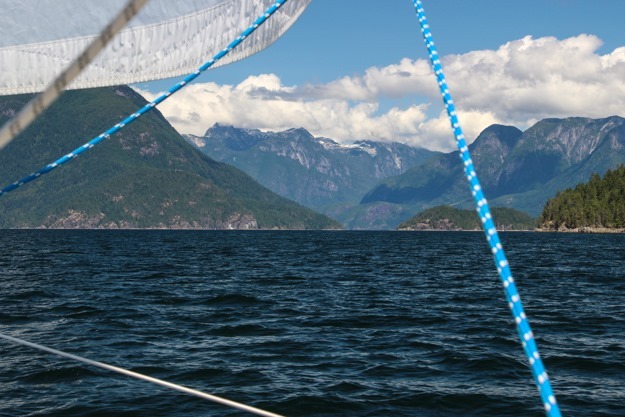 We’re heading south out of Desolation Sound towards Lasqueti and Jedediah. This entry was posted in cruises on August 2, 2018 by Patrick.